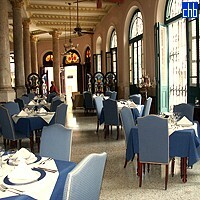 If you are looking for a picturesque base in the centre of Old Havana, look no further than Hotel Raquel. 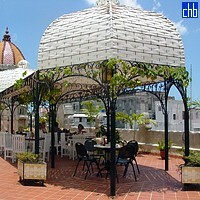 This beautiful colonial hotel is not only in the historic centre of the city but also just 5 minutes away from the impressive Malecón seawalk. 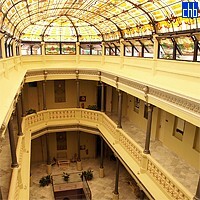 stained glass canopy roof that overlooks the stunning central lobby. There is also a beautiful rooftop terrace where guests can relax & watch life go by in the cobbled streets & squares below. Unsurprisingly, given its unique architectural features, the Raquel hotel is run by the city historian’s office, with profits going to the cultural restoration of the area. Hotel Raquel also has great modern facilities with a bar, snack bar, restaurant & fitness centre. These communal areas are also beautifully decorated & run by very helpful staff. 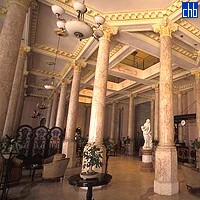 The high ceilings of the 21 standard rooms echo the hotel’s colonial past, with some also having balconies. All rooms have ensuite bathrooms as well as large beds, satellite tv, mini bar/fridge, safe & telephone. 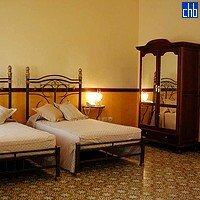 There are 19 twin rooms & 2 double rooms, while interconnecting rooms are also available for groups. The other 19 are twin bedded. 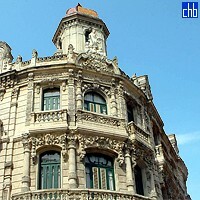 There are 16 rooms with balcony & 6 rooms without windows. There are 4 suites which, in addition to being larger & more comfortable than standard rooms, also all have sitting rooms & balconies.